I am constantly reading recipes from Food Blogs, Facebook, Pinterest, cookbooks, and magazines. I am a very visual person, I like to see what the recipe looks like when it is done, I usually can remember what it looks like and the ingredients when I am at the market from just looking at it once. This recipe caught my attention from Fitabulous on Facebook. The reviews were great and since I have loads of zucchini bursting from my garden, I thought I would give it a try. I have wanted to try a dessert recipe without oil and eggs. When hubs was biting into a piece, I told him it was Low Fat. He said, “No Kidding? ?” I don’t think hubs has ever eaten anything low fat on purpose in his life. He thought these were really great! 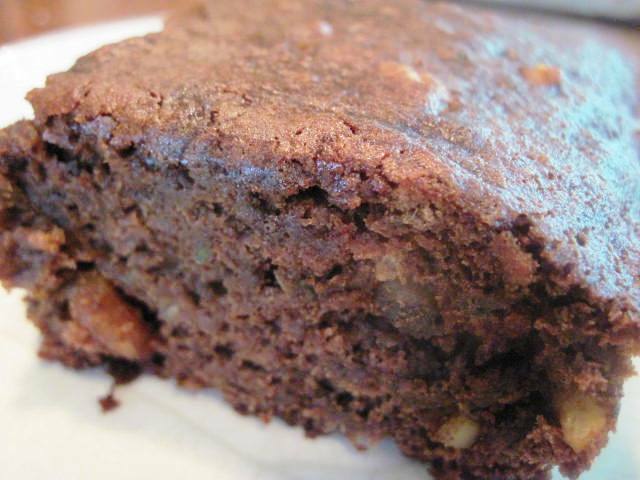 “Brownies made with zucchini, bananas, and applesauce, yielding a brownie with only 120 calories, 2 grams of fat, and a whole bunch of vitamins and minerals, and egg free. YESSSS!!!! 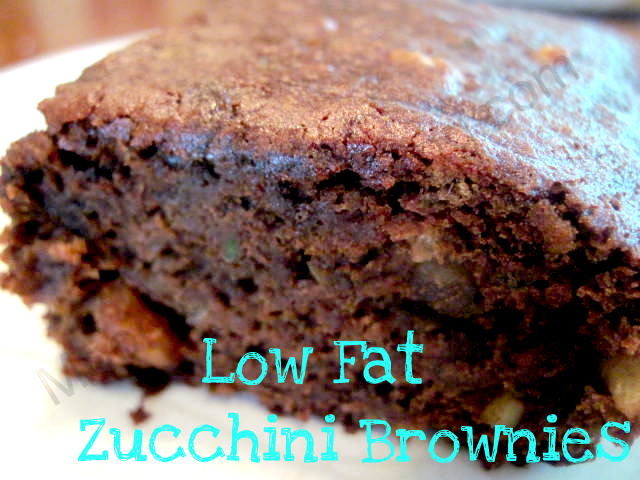 Low Fat Brownie made with Zucchini, applesauce and bananas No oil or eggs! In a large bowl, mix together the applesauce, mashed bananas, and sugar. Add vanilla and cocoa and mix together. What is the Carb amounts? Diabeetics count carbs! Could not wait to try this recipe. I had a zucchini in the frig that needed to get used and this seemed perfect. I love them. It it a little more cake like than like a brownie to me but still really good. My husband loves them. I will be making this again. Thank you so much for the recipe. So happy you like the Brownies Rhonda. They are cake like the first day, but the next day they seem more denser and brownie like, if they last until the next day! I love the fact that they’re even moister and chewier the next day! Just the way we like them. On my “chopped of fat” “to do” list! Pinned as well! Thanks Nettie! Thank you so much! I’ going to make these this evening with mashed nectarines :)Yum! Hi Nettie,wondering if i could substitute coconut flour for the all purpose due to diabetes, thank you for the recipe it sounds awesome. Absolutely, you can sub AP Flour with Coconut Flour or Almond Flour. It will taste like coconut if you use coconut flour. I would add some coconut oil too, so that it isn’t dry. In baked goods, you generally want to substitute 1/4 cup to 1/3 cup coconut flour for 1 cup grain-based flour. You will also need to increase the number of eggs, but this recipe doesn’t call for eggs, so use coconut oil. Thank you Nettie,i i will try using almond flour, i should have thought of that! Thankyou for the guide of portions for use with coconut flour and coconut oil. I can’t wait to try the recipe. Amazing recipe – have made them twice – once in a brownie pan, and the second time in my silicone mini-muffin pans to may them ‘two-bite’. I have reduced the sugar by half, and they are still fine. You can also use gf oat flour if you need it to be gluten free. Oat flour is great in general, as it is a whole grain, but much lighter than wheat. So happy that you enjoyed these brownies, thanks for the great tips as well.